I don’t want to label what we’re seeing as a bubble. But I would say that asset valuations are generally elevated.… For the stock market, the ratio of price to earnings…is near the high end of its historical range. If we look at for example of commercial real estate and other assets, we’re seeing high valuations. In other words, we should really be calling it the “everything bubble” where stocks, real estate and “other assets” (such as bonds) are all at the top their curves. But that should be no concern; and, of course, she would not label any of these things as “bubbles” because that would mean she has presided over years of creating an empty world full of financial troubles. “Bubble, bubble, toil and trouble” would, however, be the best words to describe Yellen’s policy and what is to come out of it. Those, indeed, might be the words she was incanting over this market brew in the basement of the Fed’s Eccles building, but they are not words you would ever hear the ex-chief central bankster saying in public right as she leaves office. Only historic bankster barons like Greenspan dare invoke the word “bubble” when speaking of what others have created. Beware this lady’s matzo ball soup. It was cooked in a caldron, and is being served by a cracker. A nice cracker, but a cracker all the same. And, with a cracker, comes the crunch, which is what we all felt this week. Yelled demurred on her exit interview Friday that she would have liked to have a longer stay in the top office of the Eccles building. I would have liked to serve an additional term and I did make that clear, so I will say I was disappointed not to be reappointed. I think things are looking very strong. “Looking very strong,” she said, as the Dow saluted her exit with a diabolical 666-point backward flop as she made her way out the door, having convulsed the entire week over a mere upward blip the Fed caused in long-term interest rates. Dow futures were pointing down 744 points beneath the ground this weekend. 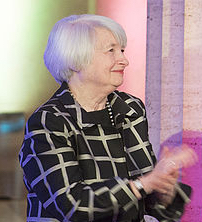 Yellen, however, was satisfied with this effect on the market. The Federal Reserve has been on a path of gradual rate increases and if conditions continue as they have been, that process is likely to continue. And as it happens we would expect long rates to move up. Fair enough. The market should react to any move back toward reality, but it should also be very scared of that reality after years of living inside the Fed’s womb because the Fed has nurtured something that has no capability of living outside in the real world. Naturally, rates will go up as the Fed now solidly engages in quantitative squeezing so the markets immediately start quantitative wheezing. That is because there is no capacity left in this economy to handle higher interest since we doubled down on debt during the Obama years. Such weighty debt does not leave true resilience of the kind Yellen goes on to talk about. It means we have less capacity to handle real interest rates than we had before the economic collapse … even measured against GDP. This past week was the first week since the Fed made its September announcement about the October start of the Great Unwind that the Federal Reserve actually delivered on its promise by removing as much money from the nation’s supply as it had said it would. The promise for previous months (October-December) had been a dip-your-toe-in-the-water test amount, and even that test amount wasn’t met. This past week, however, the Fed stepped up to its stage-two level, and even delivered a little bonus by withdrawing $22 billion, instead of the slated $20 billion. This time, the markets felt it and heaved. The entire world heaved, though there are many reasons right now for the world to heave; so it cannot all be blamed on the Fed. I’ve written often about the deepening cavern of debt that the US economy is built over. 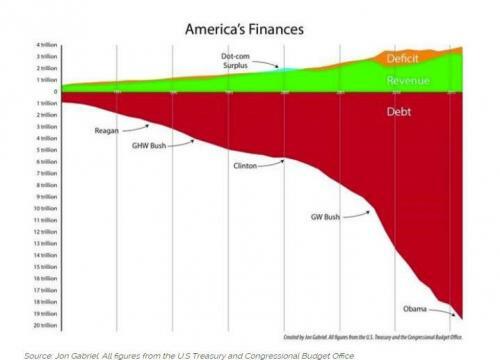 The above picture only represents the debt that the American government is built over, and that is before we deepen the abyss more with the deficits that are likely over time from the Trump Tax Cuts. Grandma Yellen is comfortable with the fact that we float on hot air over such a void, but markets are understandably nervous about what happens when interest on such a void of debt moves up even incrementally. We created that pit of debt because extreme low interest made it easy to do; but now with interest rising … we’re getting queasy. There simply is no room for any interest increase, so there is little elasticity in markets toward mere hints of an interest increase (in that all areas of the economy would look something like the above graph). The whole world has been enticed to build out on debt like that. Globally, the ratio of all debt to all GDP is at 327%. Just to be clear, that is the highest overhang any time in human history. As a point of reference, nations historically have gotten into trouble somewhere between 100% and 150%. The only reason we are all sustaining at much higher levels of debt right now is that interest is still at aberrational historic lows. But Grandma Yellen recognizes and fully expects that her move into quantitative squeezing will push interest rates up, and she believes that will all go down nicely with a well-paired glass of bubbly. Therefore, the Fed will not see the market’s current gyrations, which came as soon as it finally notched the squeeze one hole tighter, as being anything other than an adjustment to new conditions; so it will, as Yellen has said, continue to tighten on schedule. Asset valuations could change I’m not predicting that that would happen and I wouldn’t rule that out. Pretty sure last week was already a case of asset valuations changing ahead of and while you were talking, Dear Nanna. This is the debt trap that I have long been saying the Fed was creating for itself (and the world), and they are exhibiting exactly the blind self-confidence I anticipated they would. They believe in their program so Lady Yellen can sanguinely tell her listening public that all is going as planned … because that it how it looks to those who believe the reversal of quantitative easing won’t squeeze all the life out of the economy that it formerly injected into it. Problem is the squeeze can be worse than the original expansion because it comes with higher interest payments for everyone who has tanked up on debt, which compounds the tightening. Right now the belt is only pinching, but wait until it becomes a corset. They should be careful and I would stay diversified in their investments. What we look at is the likely resilience of the economy and the financial system. Diversified into what? There is no protective diversification left (except maybe gold, which the Fed also manipulates at will to save its own proprietary currency). If your primary area of investment is, as it is for most people, your retirement fund, you are limited. You cannot buy gold within that managed set of funds. You cannot buy and hold bonds outright, but can only buy into bond funds, which can experience a liquidity crisis and are already sliding because the low-interest bonds they are loaded with don’t have much value compared to the new rates that are coming. There is no sector of the stock market that is not sliding right now, and Yellen has already acknowledged that real estate could slide, too. This is the everything bubble. There is not a lot of cover for salvation through diversification when everything looks to slide together … and all nations together. In the area that I’m most familiar with — banking regulation — we’ve put in place very strong improvements to make the financial system more resilient. More and better quality capital. Capital that serves as a buffer…. If there are shocks, it leaves firms able to lend. All of us need to remember the financial crisis and the terrible toll it took on Americans. We’re glad you are taking a moment to remind your friendly coven of lead banksters that they need to remember the poorer Americans who bailed their sorry butts out (and hopefully the rest of the world that the Fed’s new course will impact). We’re also comforted to know that banks will continue to lend in the next crisis so that we can savee ourselves by deepening the money pit even more. Perhaps we can dig ourselves all the way to hell. Always, the central bank’s (and government’s) answer to our economic crises is to create more debt so we can spend our way out of it; but I don’t think we can spend our way out of this one, and I don’t think the Fed will find a lot of takers for that debt even if they reverse course and do all they can to bring interest rates right back down, effectively admitting to the world that they are not and will not ever be able to unwind quantitative easing. They won’t be able to because people will be afraid of debt all over again, having felt the fiery tongue of interest licking their fleeing feet. Moreover, they have already taken out all the debt they can afford even at low interest. We are on that top and broadest tier of a Ponzi scheme. There are no new fools left. Grandma may have us all in her heart, but she is a dreamer, smiling while insanely oblivious to how unworkable her plans are already showing themselves to be as the Hole of Hades opens up around her. I feel very good about the progress we’ve seen. Somebody needs to. As for me, I’ve always maintained the entire recovery is an illusion. It is a vast continent stretched out over a vacuum of debt that only stays aloft while the Fed’s big thrusters of quantitative easing are firing away. It is a patient sustained on life support that will die as soon as life-support is withdrawn. That has always been my primary thesis, and this week’s paroxysms are evidence of how sensitive markets are to the tiniest rise in long-term bond interest. The economy was “rebuilt” on bonds, so that is where the sensitivity lies. That does”t mean stocks won’t bounce back up from this first convulsion. I would be surprised if they don’t. Trump is adding a huge amount of debt-financed levitation himself via his Tax cuts, and the Fed’s quantitative squeezing is still set at an elementary level. Its reverse thrusters will take all the way until this fall to become fully engaged, which should be about the time Trump’s extra thrust starts wearing off a little. Somewhere between those two points is where the economy is likely get the jitters. This is probably more of a foreshock. So, as Yellen yawns about the market’s spasms at the moment of her exit, just recognize that last week was a foreshock to the Fed’s first full follow-through on its promised tightening. The next delivery by the Fed will not likely come until the end of February, as the Fed has so far shown a pattern of doing most of its balance sheet reduction at the end of the month when it knows where its balance sheet stands (which makes sense). In April, they are scheduled to increase the rate of tightening by 50%, and that’s when I think the ride will get a little more interesting. By summer, we will have had a full quarter of that, and should be feeling a little bounced around just as they hit the reverse thrusters another 25% harder. In the meantime, here is Yellen’s full exit interview for your own viewing pleasure as she assures us all that ….